In the United States, there are many different levels of poultry production systems ranging from small-scale to large-scale. Over the last couple of years, there has been an increasing number of small-scale poultry farming systems popping up across the country. A small-scale system can house as few as two birds or as many as a couple hundred of birds. Researchers at Appalachian State University in Boone, North Carolina studied the nutritional, environmental and social impacts of small-scale systems. 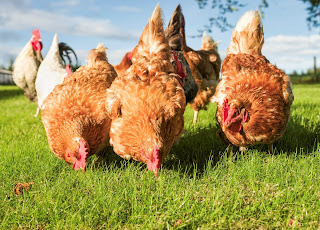 The management process of small-scale poultry farming systems most commonly involve pasture grazing, processing the birds on the farm, and selling the meat at local markets. The goals of these systems not only focus on maximizing yield and maintaining sustainable production and profit but also are meant to provide social impacts and environmental benefits to their land. The Appalachian University researchers looked into these impacts from an on the farm perspective. From a nutritional standpoint, the birds can receive protein, vitamins, and phytochemicals from farm-raised feeds, in addition to pasture grasses and forages. Allowing for the birds to graze in the pasture benefits that the land because it leads to a gradual spread of manure that increases the soil health and fertility. The study argued that while the birds are able to express natural behaviors out the in the pasture, wild predators are a challenge. Maintaining biosecurity practices is important to ensure the health and safety of the birds. Small-scale producers generally contribute birds to local food markets. The study addressed how food safety management is critical to reducing risks for the local consumers. It is important for all small-scale producers sharing their birds with locals to have an awareness of food safety. Researchers analyzed resource use and income efficiency and found small-scale farming systems to economically be less efficient than large-scale, indoor production systems. This is partially due to the amount of time it takes for the birds to grow, requiring more feed. Keeping in mind the goals of small-scale poultry farmers, economic impacts are not their only focus; the environmental benefits the birds can have on their land and the contributions the birds provide to their local communities is a desire among small-scale producers.